Project consists of a group of tasks, performed in a definable time period, in order to meet a specific set of objectives. It is a temporary activity. It is a one-time program hence different from operations where tasks are repeated in a routine way. Every project has a life cycle, with a specific start and end. The work scope of a project can be categorized into definable tasks. Project has a budget within which it is required to be completed. During the execution of the project, there is likely requirement of multiple resources. Many of these resources can be scarce and may have to be shared with others. Steel project like any other project has a life cycle (Fig 1) which includes (i) initiation, (ii) planning, (iii) execution, (iv) monitoring and control, (v) commissioning and handing over, and (vi) closing of the project activities. Steel project has four components namely (i) performance, (ii) cost, (iii) time, and (iv) scope. All these four components are interrelated and dependent on each other. Performance is the quality of the work being done. Cost is the expenditure made on the project work and is directly related to the human and physical resources applied. Time is the schedule which is required to be met for completing the work. Scope is the magnitude of the work to be performed. One of the key ingredients for successful project management in a steel project is having the right people on the job and managing them appropriately. Both of the two elements ‘having the right people’ and ‘managing people appropriately’ are important for the project success. However, in practice both conditions are frequently violated. There are several groups of activities in a steel project which are required to be managed. These include (i) concept and site finalization, (ii) feasibilities studies and establishing of project schedules, (iii) approvals and consents, (iv) design and engineering, (v) project planning, (vi) monitoring of all project activities and processes along with control of changes, (vii) contract and procurement, (viii) materials’ receipt and storage, (ix) budget and expenditure, and (x) construction activities at site consisting of civil, structural, erection and commissioning work, and (xi) project handing over and closing. These activities include defining of the work and the development and tracking of the schedules, resources, and costs. Steel project requires the investment of considerable finances and labour prior to its commissioning and handing over. Hence, containing of the resource expenditures is one of the main driving factors in a steel project. Also a need exists for the quality of the steel project which is handed over to be of the highest quality. Project management consists of managing of the execution of the project tasks which include (i) work scope, (ii) time period, (iii) resources, (iv) costs, (v) quality, (vi) communication, (vii) co-ordination, (viii) risk, , and (ix) safety of men and equipment. Project management is carried out through a set of tools, techniques, and knowledge which, when applied, helps in the achievement of better results during the life cycle of the project. Project management consists of integration of the project activities with the project tasks to meet project objectives as the project moves forward in its life cycle. The major objectives which are required to be met include performance, cost, and time goals, while at the same time there is a need to control or maintain the scope of the project at the correct level. Ideally, the scope of a project is expected to remain constant throughout the life of the project. But this rarely happens. In most cases the scope of the work increases as a result of overlooked details, unforeseen problems, or an inadequately defined objective. In rare cases change of technology can also become a reason for the change of scope. The most common reason for scope changes is that something is forgotten. Project is managed generally by an organization which normally develops along with the project and hence does not have established set of procedures and processes. Hence during the project execution, the practices which are adopted are usually much different than what are adopted during the operation stage after the completion of the project. During the project management, specific tasks and resources are required to be managed against a time-oriented set of objectives. The budgets are associated with the defined work, within a specified time frame. Resources are often controlled by the people who are not under direct control of the people managing the project. Further, measurement and control practices involved in a project for a task may vary with the measurement and control practices involved in other task since multiple agencies are working in a project. A steel project is done only once, whereas work during the operation of a steel plant is of repetitive nature, and management of one-time jobs is different from managing repetitive types of jobs. Also, the people who work on a steel project may be reassigned to other jobs once the project is completed, so the team is temporary. Often, the team members do not report to the project manager on a regular basis, meaning that the project manager has no direct authority over them, a situation that presents its own set of problems. Project normally consists of activities, (i) which have interrelationships amongst one another, (ii) which produce quality approved deliverables, and (iii) which involve multiple resources. Project is not synonymous with product. 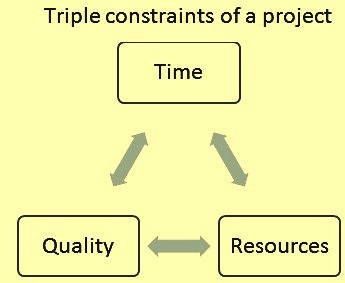 The concept of project management is based on the variable of triple constraints consisting of time, resources, or quality (Fig 2). Important characteristics of a project are given below. Uniqueness – Every project is unique since its output varies with the output of even a similar other project. It is not unusual, however, for multiple units to be involved in a project at one level of detail or another. Activities of project – A project is usually consists of several activities which are interdependent activities. These activities have a beginning and an end and many of the activities are interrelated in one of three possibilities namely mandatory, discretionary, or external. In case of mandatory situation, one activity must be completed before another can begin. Generally, these mandatory relationships are very difficult to violate, or to do so just does not make sense. In case of discretionary situation, the relationship of other activities is not as obvious or as restrictive and the relationship interdependencies are based on the preferences of the people developing the plan. The third possibility relates to some activities which are dependent upon some external event, such as receiving the equipment and materials from the supplier. In any of the three instances, mandatory, discretionary, or external, activities have a relationship one to another. Project output – Each project creates a quality deliverable(s) which must meet a standard of performance criteria. In other words, each deliverable from every project must be quality assured. If the deliverable does not meet its quantifiable quality criteria then the project cannot be considered complete. Resources – Project involves multiple resources consisting of human, material, and financial resources. A close co-ordination is needed between these resources because of inherent characteristics of these resources. Further there may be conflicts between resources with respect to quantity, timing, and specific assignments. These conflicts need to be resolved for the project work to move forward. Hence resource management skills are needed during the execution of the project. Independent nature – Projects are not synonymous with the products of the project. Project activities are unique activities required to create the product of the project. These unique activities are heavily dependent on the planning and controlling of the effort. Project drivers – Projects are driven by the triple constraints which represent the balance of time, resources (human and otherwise), and technical performance (quality). One of these three constraints is the driving factor for the project. Different projects may be driven by a different constraint depending on the emphasis established by the project environment. There are several components of the project management. Major amongst these components are given below. General management – It includes (i) management of stake holders such as government and local authorities, statutory authorities, and local community etc., (ii) management of media and project publicity materials, (iii) arrangement of security and vigilance in the area of project, (iv) planning and execution of the enabling works, (v) assembling of the core project team, (vi) finalization and standardization of project processes and procedures, and (vii) taking care of issues related to health, safety, fire and environment. Strategic management – This includes (i) finalization of project success criteria, (ii) making of strategic plan for project execution, (iii) setting of the project organization which includes divisions and departments, (iv) finalization of the values and ethics for the project organization, (v) management of the risks, (vi) finalization of the quality criteria to be followed during project life cycle. Control management – It includes (i) work content and scope management, (ii) scheduling and phasing of the project activities, (iii) management of resources, (iv) budgeting and cost management, (v) management of project expenditure, (vi) change control management, (vii) management of communication and flow of information both internally and externally, and (viii) monitoring and control of the project progress. Management of technical activities – It includes (i) controls during design and engineering, (ii) project evaluation and reviews, (iii) technology management, (iv) finalization of guarantee parameters and handing over criteria, (v) requirement management, (vi) estimation and measurement of the work, (vii) technical co-ordination between various agencies employed for the project, and (viii) quality control during work execution. Commercial activities management – It includes (i) management of procurement activities which starts with the approvals of vendors and preparation of tender documents for materials as well as plant and equipment, (ii) financial management which is an important part of the commercial activities since timely payment to the suppliers/contractors ensures continuity in the project work, (iii) contract management during execution, (iv) co-ordination with and between suppliers/contractors, (v) management of plant and equipment insurance, and (vi) legal awareness. Organizational management – It includes (i) design the life cycle of the project, (ii) development of the structure of the project organization in the initial stages of project, (iii) development of the structure of operational organization during later part of the project, (iv) management of project planning activities, (v) creation of organizational assets and their management during project period, and (vi) organization of training of operational employees in plant and equipment operation. Human resource management – It relates to people management during project period and includes all the activities related to personal department which includes (i) recruitment, (ii) compensation and motivation, (iii) employees’ appraisal, (iv) delegation of power / authority, (v) leadership, (vi) team work, (vii) conflict management, (viii) industrial relations and so on. Strategies for the attainment of the project objectives are to be developed in as comprehensive a manner as possible, right from the outset. The development of the design criteria and the technical elements of the project are to be handled with the utmost care. The design standards selected affect both the difficulty of construction and the operating characteristics of the plant. Maintainability and reliability are the critical factors in determining the project’s operating characteristics. Technical problems have normally a huge impact on the likelihood of project overrun. Hence, thorough risk analysis is essential. The technology to be adopted in all relevant departments of the steel project is to be examined and only that technology must be used for the design of the plant which is well tested and changes in design during project implementation is to be kept to a minimum. However, no design is ever complete and technology is always progressing. A central challenge in the effective project management is thus the conflict between meeting the schedule against the desire to get the technical base which is latest. The orderly progressing of the project’s sequence of review stages—the level of detail becoming progressively tighter, with strict control of technical interfaces and of proposed changes (through configuration management)—is now a core element of modern project management of a steel project. Each technology change is to thoroughly reviewed with respect to cost, schedule, and performance. Implication before its acceptance for incorporation and rigorous control is to be exercised subsequent to incorporation of the proposed change. Planning activities are central to the project management and they continue throughout the project. In fact, planning is the cornerstone of the project management approach. Also, scheduling is often confused with the planning. But these two are separate and distinct functions. Plans are to be simple and practical. Both the strategic planning and tactical planning are important. Strategic planning is the approach being used to do the project while the tactical planning is the steps taken to implement the strategy or approach chosen. Quite often, the main cause of cost over-run and delay in the project execution is the forgetting to plan certain part of the project or certain activity of the project. With the start of activities of the project, the project manager always has extraordinary demands on his time and there is pressure on time towards action. In the process, project planning gets neglected and takes a back seat. This has an adverse impact on the project implementation since the work on the project proceeds in an unsystematic manner. Planning activities are frequently revisited at multiple points within the project. Every aspect of the project is impacted by the project management plan or impacts the plan. It provides input to the executing processes, to the monitoring and controlling processes, and to the closing processes. If a problem occurs, the planning activities can even provide input back to the initiating activities, which can cause the project to be re-scoped and have a new delivery date authorized. The project manager integrates and repeats the executing processes until the work planned in the project management plan has produced the required deliverables. The project manager uses the project management plan and manages the project resources to actually perform the work planned in the project management plan to produce the project deliverables. During execution, the project manager also develops and manages the project team and facilitates quality assurance. The project manager also ensures that approved change requests are implemented by the project team. This effort ensures that the project objective and project items are modified per the approved changes. The project manager communicates status information for the stakeholders to know the project status, the started or finished activities, or the late activities. Key outputs from executing the project management plan are the deliverables for the next phase of the project or even the final handing over of the project. The project manager uses monitoring and controlling processes to observe all aspects of the project. These processes help the project manager actively learn whether or not there are potential problems so corrective action can be started before a crisis results. Monitoring project execution is important, since a majority of the project’s resources are expended during this phase. Monitoring includes collecting data, assessing the data, measuring performance, and assessing measurements. This information is used to show trends and is communicated to show performance against the project management plan. Decision making is very important aspect of the project management. 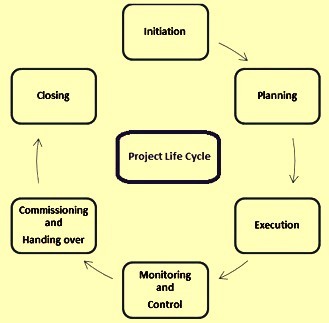 During the project life cycle, it is important that right decisions are taken and they are taken at right time. Faulty decisions or delay in taking the decisions impacts the project progress adversely and also has adverse impact on all the project components. Steel project is usually associated with a number of other activities which are not part of the steel project but are interfaced with the steel project. These interfaced activities are generally projects in themselves and are usually implemented by other agencies. These interfaced projects are required to be completed along with the steel project. Success of steel project depends on the timely completion of these interfaced projects. Hence, project management in a steel project also requires monitoring of the progress of the interfaced projects. Project structural management also known as ‘configuration management’ is an essential aspect of establishing project control. Configuration management is required across the entire organization, including procedures that ensure that versions are controlled and only approved changes are implemented. The project implements aspects of change control necessary to continuously manage changes to project deliverables. The project manager must integrate his monitoring and controlling activities to provide feedback to the executing process. Some information is also being feedback to the planning process. However, if there is a high-impact change to the project scope or overall plan, then there is also being input to the initiating processes. The closing processes require the project manager to develop all procedures required to formally close a project or a phase. This group of processes covers the transfer of the completed part of the project to the operational set up along with the project information to the appropriate authorities.